The saga of Lisbeth Salander has spanned a collective eight films and novels, meaning any new entry has the uphill battle posed by familiarity. Director Fede Alvarez (Don’t Breathe) faced another hurdle with his take on The Girl: having to inherit and repurpose the franchise clothing weaved by David Fincher’s entry. The Girl in the Spider’s Web goes back to the childhood of infamous hacker Lisbeth Salander (Claire Foy), and to a home of familial abuse. Lisbeth escapes, but leaves a sister behind. Now the thorny adult we know, Lisbeth takes on a simple job that spirals beyond her control. With the past threatening to resurface at every turn, and a nuclear threat bubbling ever higher, Lisbeth must rely on old friends and new accomplices to face personal demons and global dangers. 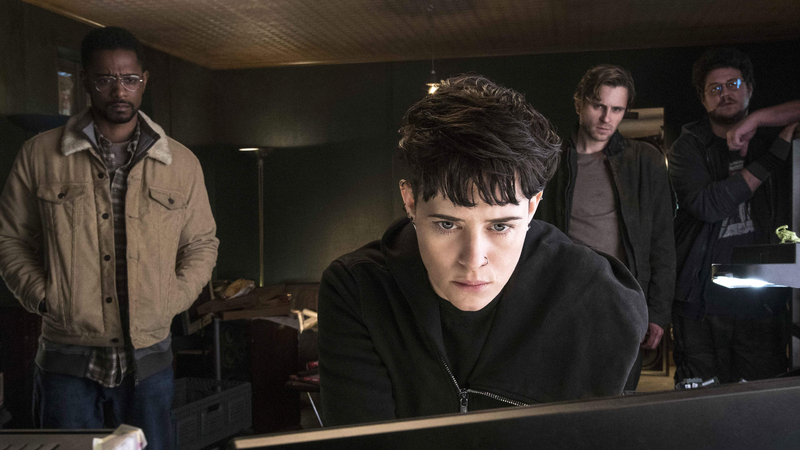 While The Girl in the Spider’s Web sounds like a blistering pager-turner, in practice its pace is somewhat scattered. Stuck between a spy-actioner and mystery procedural, the film sags. Along the way, it does allow for capitalizations on Foy’s incredible talent, and crafts some pathos for Lisbeth through historicity and visual conceits. Alvarez is at his best when visualizing his ideas, unhinged from words and sometimes even narrative movement beyond what matters in that immediate space. It is this kind of pure expression that heightened Don’t Breathe through its formalist fixations on tension, and imbued Evil Dead with propulsive lunacy. In The Girl in the Spider’s Web, Alvarez works from his biggest canvas yet, painting snowy vistas, pulsing nightclubs, and motorcycle chases with verve. A visual highlight is in a museum, where the projections of swirling flames around Lisbeth illustrates interior turmoil, just as their shifting colors depict decision-making. Or when Lisbeth, at a moment of reflection, is seen through a tiny mirror on a big wall, her whole existence encapsulated in solitude. Evil Dead demonstrated Alvarez’s ability to build toward a satisfactory payoff, implementing ratcheting tension and extreme gore to deliver effect and rhythm. There are sequences of this ilk in The Girl in the Spider’s Web, as Alvarez stages bouts of white-knuckle suspense and bloodied brawls – including a solid drug-addled car chase – but gone is the precise clarity of cutting and geography that made his previous works sing. This rugged inconsistency is a melting pot for the emotionalism in the film’s finale, amidst snowy tears, pulling in ideas of doing profoundly bad deeds for good reasons, but understanding those reasons don’t make it okay. It’s a complex notion worth investigating, one contrasted by another about simply burning down what hurts you. Yet the film has taken a roundabout path to get there, relying on a labyrinthine structure when it should just let its bruised heart shine through. The Girl in the Spider’s Web demonstrates how uncertainty is a detriment, just as it proves Alvarez will always be a stylist worth watching.